, archbishop of Canterbury in the eleventh century, was an Italian, and born in 1005 at Pavia, being son of a counsellor to the senate of that town; but, losing his father in his infancy, he went to Bologna. Hence, having prosecuted his studies for some time, he removed into France in the reign of Henry I. and taught some time at Avranches, where he had many pupils of high rank. In a journey to Rouen, he had the misfortune to be robbed, and tied to a tree on the road, where he remained till next day, when being released by some passengers, he retired to the abbey of Bee, lately founded, and there took the monk’s habit in 1041. He was elected prior of this religious house in 1044; and opened a school, which in a little time became very famous, and was frequented by students from all parts of Europe. Amongst others, some of the scholars of Berenger, archdeacon of Angers, and master of the school at Tours, left that, and went to study at the abbey of Bee. This, it is said, excited the envy of Berenger, and gave rise to a long and violent controversy between him and Lanfranc, on the subject of the eucharist. (See Berengarius). 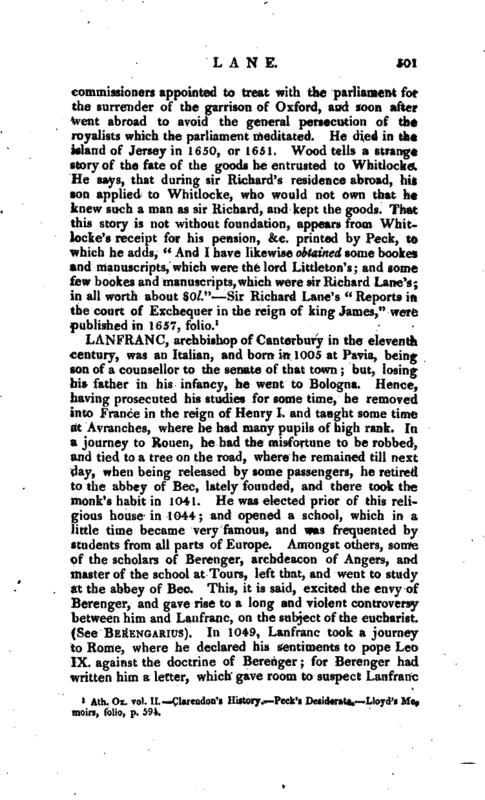 In 1049, Lanfranc took a journey to Rome, where he declared his sentiments to pope Leo IX. against the doctrine of Berenger; for Berenger had xvritten him a letter, which gave room to suspect Lanfranc | to be of his opinion. Soon after, he assisted in the council of Verceil, where he expressly opposed Berenger’s notions. He returned a second time to Rome in 1O59, and assisted in the council held at the Lateran by pope Nicholas II. 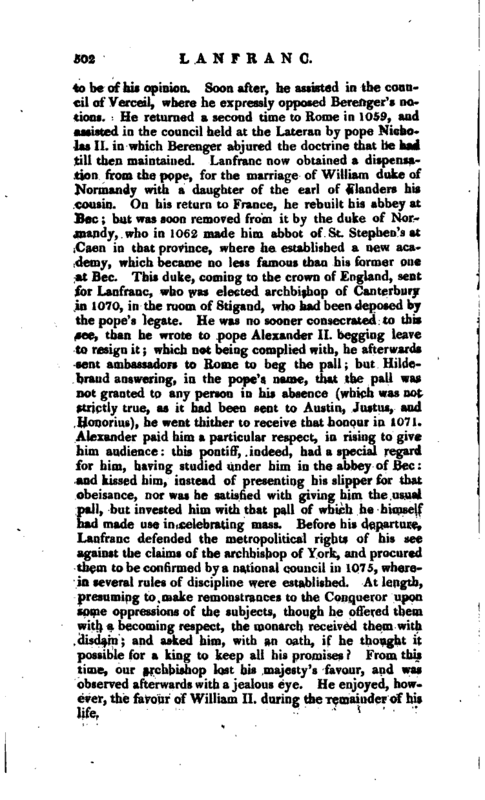 in which Berenger abjured the doctrine that he had till then maintained. Lanfranc now obtained a dispensation from the pope, for the marriage of William duke of Normandy with a daughter of the earl of Flanders his cousin. On his return to France, he rebuilt his abbey at Bee; but was soon removed from it by the duke of Normandy, who in 1062 made him abbot of St. Stephen’s at Caen in that province, where he established a new academy, which became no less famous than his former one at Bee. This duke, coming to the crown of England, sent for Lanfranc, who was elected archbishop of Canterbury in 1070, in the room of Stigand, who had been deposed by the pope’s legate. He was no sooner consecrated to this see, than he wrote to pope Alexander II. begging leave to resign it; which not being complied with, he afterwards sent ambassadors to Rome to beg the pall; but Hildebrand answering, in the pope’s name, that the pall was not granted to any person in his absence (which was not strictly true, as it had been sent to Austin, Justus, and Honorius), he went thither to receive that honour in 1071. Alexander paid him a particular respect, in rising to give him audience this pontiff, indeed, had a special regard for him, having studied under him in the abbey of Bee and kissed him, instead of presenting his slipper for that obeisance, nor was he satisfied with giving him the usual pall, but invested him with that pall of which he himself had made use in celebrating mass. Before his departure, Lanfranc defended the metropolitical rights of his see against the claims of the archbishop of York, and procured them to be confirmed by a national council in 1075, wherein several rules of discipline were established. At length, presuming to make remonstrances to the Conqueror upon some oppressions of the subjects, though he offered them with a becoming respect, the monarch received them with disdain and asked him, with an oath, if he thought it possible for a king to keep all his promises From this time, our archbishop lost his majesty’s favour, and was observed afterwards with a jealous eye. He enjoyed, however, the favour of William II. during the remainder of his life. | Some years before this, Gregory VII. 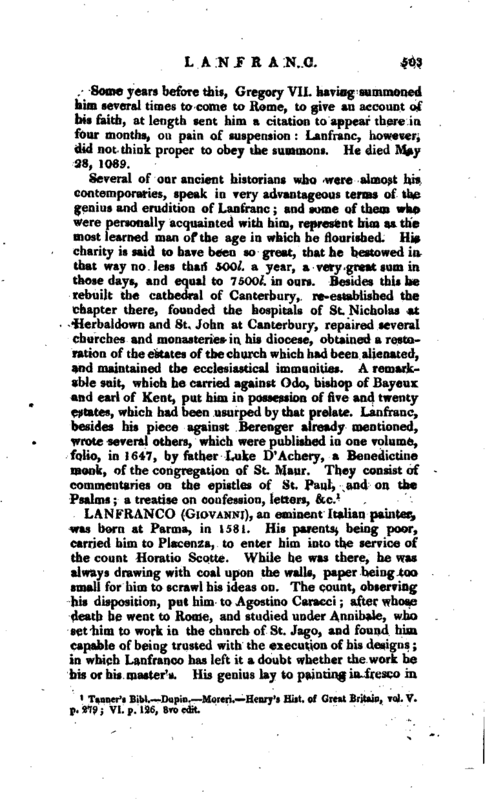 having summoned him several times to come to Rome, to give an account of his faith, at length sent him a citation to appear there in four months, on pain of suspension: Lanfranc, however, did not think proper to obey the summons. He died May 28, 1089. 1 Tanner’s Bibl. Dupin. —Moreri.- Henry’s Hist, of Great Britain, vol. V. p. 279 ’, VI. p. 126, Sroedit.